We had been preparing for a different holiday release entirely when in a meeting Mysterious Staffer X our team mascot came up with a brilliant idea... Divide the content that would be the release over many releases making several extra large releases and then on April First release nothing at all.. no one not in the know could possibly expect such a release as nothing at all. Not from AQ which has taken the holiday so seriously in the past. Why nothing at all was clearly the surprise of the lifetime. But how to hype nothing.. now thats a trick.. So we hopped in the Mock Six and moved at warp speed to race for ideas... and then another brainstorm. How we could trixie the players. Pseudoreverse psychology! Why if we tell them outright there is nothing.. they are sure to think there is something.. and then when they get nothing.. it will be an even BIGGER prank! So we all went to sleep early and none of us prepared anything. We shelved our plans and moved on. We sent out the newsletter setting things up and I had time to catch up on my baking. Lacking an outlet in the Zardian this year I decided to share with you. Butter two 9-inchx13 cake pans then line the bottom with parchment or wax paper. Preheat the oven to 350°. Melt both chocolates together with the water in microwave. Stir until smooth, then set aside until room temperature. In the bowl of an electric mixer, or by hand, beat the butter and 1 ¼ cup of the sugar until light and fluffy, about 5 minutes. Beat in the melted chocolate, then the egg yolks, one at a time. Mix in half of the dry ingredients into the creamed butter mixture, then the buttermilk and the almond extract, before the rest of the dry ingredients. Pour batter into cake pan, smooth the top, and bake for about 45 minutes, until a toothpick inserted into the center comes out clean. Cool cake completely before serving with vanilla ice cream and toasted coconut. The recipe much like this post is cake. Wellllllllllll... I suppose I could be persuaded to share a recipe from my own files too, since I've got plenty of time on my hands and all. I'll go a little different direction than Falerin. The prep for this one takes two evenings, but it's worth it. * Place chocolate crumbs, espresso powder, and sugar in food processor. Start processing, and drizzle butter through the feed tube. Mix thoroughly until the texture of damp sand is achieved. * Dump mixture into the center of a 10-inch nonstick springform pan. Pat into an even layer on the bottom and about 1/3 of the way up the side. Don't worry if it's slightly uneven/ragged at the top. * Bake in preheated oven for 15 minutes (10 in a convection oven). Remove and allow to cool thoroughly. * Turn the oven temperature down to 300F. Put a pan of water in the bottom of the oven -- this will create a warm steamy environment for baking the cheesecake without baking it IN a water bath. * Beat together the cream cheese and sugar in a heavy-duty mixer until thoroughly combined and fluffy. Add almond extract and vanilla bean paste, and beat well to combine. * Scrape half of the batter over the cooled crust. Spoon wild berry preserves onto the batter and swirl with a table knife. Scrape the rest of the batter into the pan and smooth so it is even. * Place on the center rack and bake at 300F for 1 hour 15 minutes (50 minutes to 1 hour in a convection oven). * Remove from oven when done and cool on a wire rack to room temperature -- cake will be set around the edges but somewhat jiggly in the middle, which will be cooked and set by the residual heat. * Wrap pan in foil and refrigerate for at least 10 hours or until completely cold. 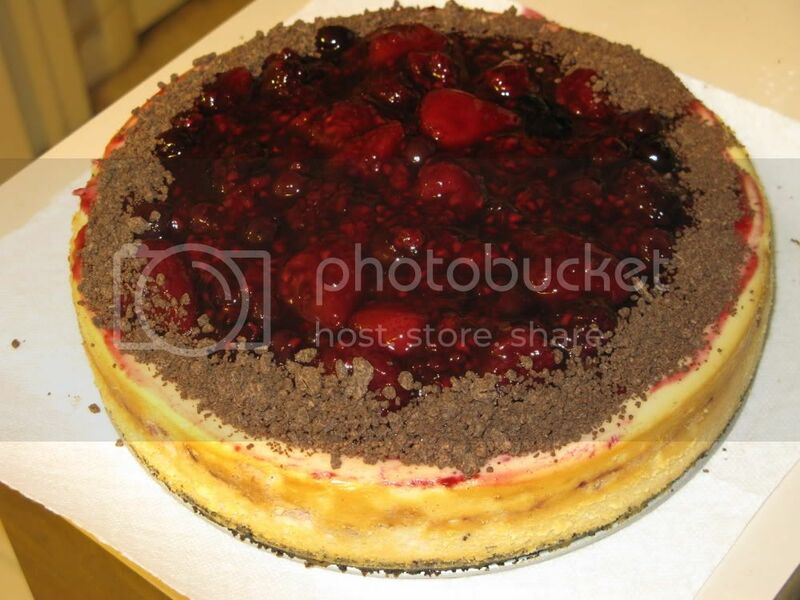 * While the cheesecake is baking, make the topping -- put the berries, preserves, concentrate, almond extract, and sugar into a saucepan and bring to a boil, stirring, until the preserves melt and some juice is released by the berries. * Add the cornstarch and water and stir until the liquid thickens. Remove from heat immediately, put the contents of the pan into a covered container and chill completely. * Finely grate the chocolate (for the ganache) in a food processor or by hand and put into a heat-proof bowl (i.e. glass). * Remove the cheesecake from the fridge -- the center of the cake should have shrunken slightly as it cooled, leaving a raised rim all around. * Allow the ganache to cool slightly. It should be thick but pourable, and cool enough that it won't melt the top of the cheesecake. Pour the ganache into the center of the cheesecake and smooth it, leaving the rim plain and uncovered. * Put the cheesecake back into the fridge, uncovered, for about a half hour or until the ganache is mostly set. * Take the cheesecake back out and spoon the wild berries over the ganache, covering it completely, and sprinkle toasted almond slices or shaved chocolate over the edge, leaving the cheesecake rim bare. * Chill until serving time. This is what it looks like. It's thick and rich and incredible. You only need a tiny slice. 1/4 cup double mint cream see Loremaster's Annotation. For the crust: Preheat oven to 350 degrees F. Spray an 8-inch square metal baking pan with nonstick spray and line with foil. Pulse the cookies and almonds in a food processor add the butter, sugar, and salt and continue pulsing to make a fine crust. Evenly press the crust into the prepared pan taking care to cover the bottom completely. Bake until the crust sets, about 15 minutes. Blend the cream cheese, 2/3 cup of the sugar, and 1/2 cup of your soured cream of choice together in the food processor until smooth. Scrape down the sides, as needed. Add the eggs and melted chocolate then pulse until just incorporated and smooth. Pour the filling evenly over the crust and bake until the filling puffs slightly around the edges and just set in the center, about 20 minutes. Mix the remaining cup of soured cream and 2/3 cup sugar with the mint cream and food coloring, if using. Carefully, spoon the mixture over the top of the chocolate and gently spread into an even layer. Bake until topping becomes glossy but is still a bit loose, about 15 minutes more. (The topping will set when cooled.) Cool on a rack. Cover and refrigerate for at least 2 hours or overnight. Lift cheesecake out of the pan, cut into 2-inch squares and then cut across the bias to create trianges, and top with whipped cream and chocolate curls. Loremaster's Annotation: Certain Terran liquids known as Creme de Menthe can be used if you use the white rather then green sort. However a better and all around more family friendly solution is to use 1/8 cup heavy cream + 2 tsp spearmint extract + 1 teaspoon peppermint extract. Stir to combine and then add additional cream to bring volume to 1/4 cup.